The annual event of pigs, crop art and food-on-a-stick calls me once again. It was a remarkable day of endless walking, sights and sounds as only a fair delivers (particularly redolent as experienced from the Sky Ride overhead), and two highlights in particular (food to come in a moment). Raptor Show: a little bit of environmental awareness, falconry and, yes, even patriotism. An hour at the DNR (Department of Natural Resources) building watching up close, owls, hawks, falcons and the grand finale: the American Bald Eagle (nice way to stir up the emotions and get the crowd to donate to the predator bird demonstration). Which I gladly did. It was wonderful. Miracle 0f Birth Center: as it sounds. A building dedicated to the actual births of farm animals: from rabbits to pigs to cows, goats, and other ruminants. Pretty much every year, by the time my fair buddy Steve (see above: Paul Bunyan) arrive at the pavilion, we have missed the LIVE births, left to just watch the videotape version of the ‘miracle of birth.’ I thought there would be a repeat of that this year, when I spotted 30-minute old piglets (‘oh, you just missed it!). Until we saw the crowds gathering five deep around the cow pen. We watched a calf born. Cow in labor (and eating while doing it, btw) – baby dropped to the hay. While little children and families and young couples and urban folks, too – all gathered around to watch this Miracle of Birth. It was — don’t use this word lightly — awesome. After that, we wandered to take in the rest of the fair and check off some items from the “new foods” list. So — drum roll please: here is what we ate on the opening day of the Minnesota State Fair (not necessarily in order – the carbs killed some brain cells along the way, methinks). My goodness, I must be slipping — is that really ALL we ate at the fair? There could be some updates to come, once the carbohydrate hangover passes. Have You Seen My Little Piggy? 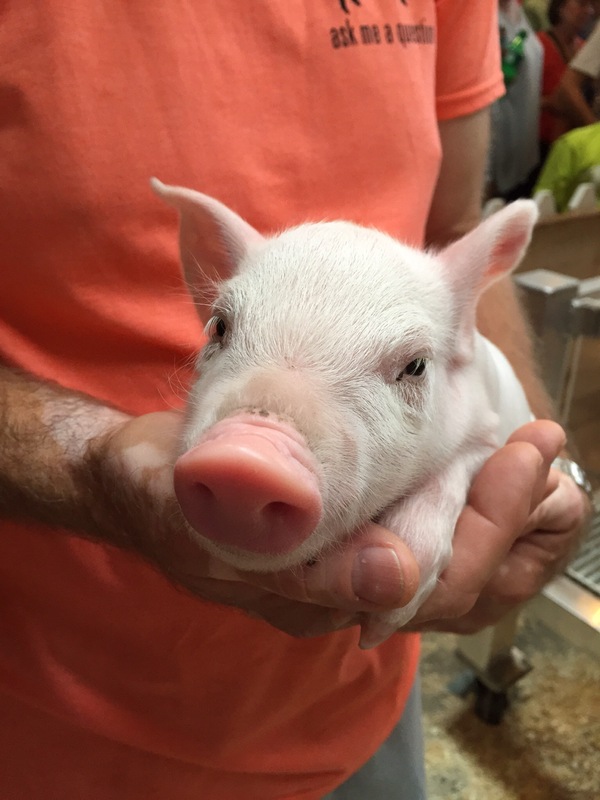 Before I regale you with my list of food I ate at the great Minnesota Get-Together — I just have to talk about this piglet I met at the Swine Barn. They do not make a cute alert LARGE enough for this little three-day-old creature. I recommend you make a copy of this and every time you get sad or blue or angry or just plain bummed: look at this creature. I defy you not to smile. Honey sunflower ice cream, honey tasting, corn on the cob, “Blue Cheese Corn Fritz” (corn fritters with blue cheese, corn kernels served with dipping sauce), half of a succulent sweet peach, Pronto Pup, Walleye-stuffed mushrooms, German Nic Nacs (double crunch peanuts), couple sips of beer – including maple bacon beer, draft root beer, shared turkey sandwich, tasting of cheese cubes, and a bite of a “rollover” (apple turnover). I read my list to a Minnesota friend and he said it sounded like a lot. To my State Fair “husband” it seemed like a hell of a lot less than years past–by a third from our peak. BLUE CHEESE AND CORN FRITZ! Walleye Roll move over! There’s a new fave food in town. You are looking at the Blue Corn and Cheese Fritz. It is a top-notch combination of tender corn fritter with the perfect choice of blue cheese for the fair crowd (Gorgonzola) speckled with succulent kernels of good ol’ Minnesota corn. With a side of chimichurri sauce that condimented the crispy, deep-fried but not greasy, balls of wonderfulness perfectly. If you have the good fortune of being close to St. Paul and could go to the Minnesota State Fair, you can get these little paragons of deliciosity at the Blue Barn food stand in the newly completed West End Market.